IFMARC is the only FIFA and AFC excellence center in central Asia which has started to hold annually football clinic congress since 2017 with support of AFC. this congress will focus on different subjects including; health, media, management, technology, coaching and analysis. In 2015, Iranian Center for Medical Assessment and Rehabilitation, IFMARC, became the member of the 30 countries that are licensed by FIFA. From 2017, IFMARC was mandated to host the Annual Congress of Clinical Football, including “professional football medicine and sciences speeches and workshops and the granted attendance certificates. Considering the interest and investment in football medicine and sports sciences in recent decade, most of scientists and specialists have been interested in football clubs and organizations and have started to compare instruction equipment, innovations and recruiting medical staffs from all around the world. The Congress, with the aim of transferring knowledge amongst various groups of football audiences, has sought to attract and engage with individuals and professionals active in the international arena. We believe that knowledge transfer provides the best practices for improving athletes' health, sports and athletic performance and bringing together domestic and foreign specialists in various fields of football and football medicine, exchanging their views and transferring their information can provide a platform for improving the quality of medical services internationally. Invitation call for all your scientific papers and specialized posters from all scientists and experts, professors in football science and also football medicine. The goal of the 2nd International Congress of Clinical Societies is to bring scientific scholars together with coaches and referees to share their ideas and experiences in the field of football science. This congress provides opportunity for scientists and professionals to discuss about new methods and topics available in sports and sports medicine and challenge each other. Football is developing rapidly in the ancient continent. Different parts of the football are connecting to each other like a chain, and when something separates one part of this complex, it won’t work well anymore, so we need to instruct all football staffs well in order to develop. Volunteers who are willing to participate in this congress must apply their proposals in the mentioned subjects and take part in the practical and modern workshops and get familiar with the newest achievements in different fields of football. Second international football clinic congress will be held on 20-21st in December in following year in Tehran with collaboration of AFC. Physical examination of the professional and amateur athletes and referees before the start of the sports season according to FIFA standards and by the Sport physicians. Formulating rehab protocols in such a way that athletes return to sports fields in the least possible time. Provide a fit diet for athletes. The first FIFA medical center of excellence in Asia and the exclusive FIFA medical center of excellence in Iran. We are an ambitious team to provide all medical services to the all athletes based on the latest and newest international standards and we are looking for improving the quality of our services in the center every day. Bringing the various components of football and sharing of expertise and experiences on a common professional platform is yet another right step forward towards the development of the sport. Football due to its worldwide popularity and the high level of play puts enormous complex demands on care of players as well as organizational framework of the sport. Organization and preparation for football events often stretches multiple resources such as financial, medical, training technical to name a few. Access to sound evidence based medical services, the practice of interventional injury prevention programs and its implementation, the technical support and appropriate coaching environment are some of the challenges faced by teams in Asia. It is important to understand each other related areas of football in order to best adjust, contribute and cooperate for a common goal as a professional team. It needs a multi-disciplinary approach, team work and trust in each other that brings about positive outcomes. Hence, wining the hearts and minds of team members is essential for its success. The sport of football is confronted with various political, geographical, scientific and managerial challenges. Lack of scientific data on playing football at high altitudes, environmental pollution, age determination, confounding gender verification procedures, travelling across several time zones and its effects on performance, tight football schedules, governmental interferences, racial and match fixing as well as organized doping operations needs to be addressed and come up with fruitful solutions or directions. I sincerely hope that this Congress will make some inroads into unchartered areas through scientific cooperation and research. Hope participants will share their expertise, increase their international network of experts and enjoy the great hospitality of the Iranian People. 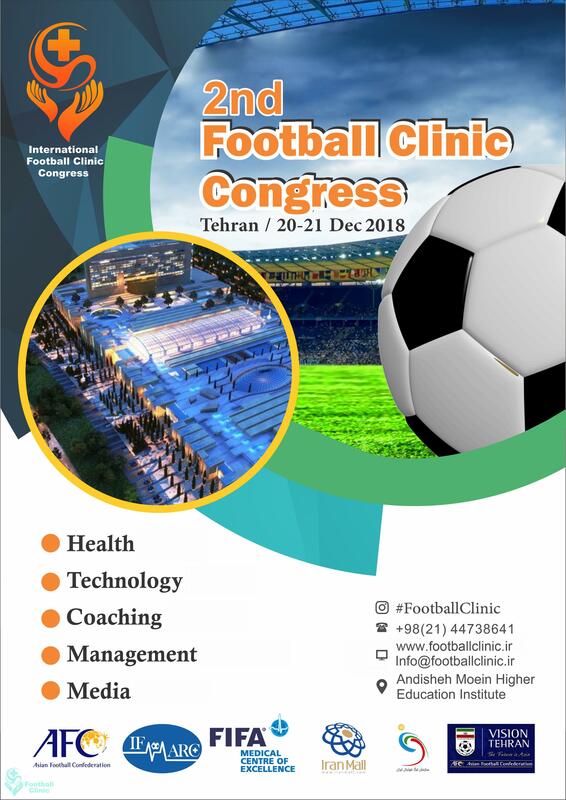 I am honored to introduce you the 2nd international football clinic congress which is supposed to take place in following December in Tehran. It’s so crucial for us that this kind of gathering happens annually in different counties of Asia. This congress will be held with support of FIFA, AFC, Iran Mall, FIFA medical center of excellence in Algeria by IFMARC. According to AFC’s motto which says “one aim, one goal” we all are going to do is develop soccer in every fields in the best possible way. Therefor I want to ask you to join us with your presence. The Event Agenda Table of the second international Football Clinic congress is available for download in PDF format at the bottom of this table. Social Responsibility in Football Dr. Ehsan Mohammadi Does football have any responsibility for hope and despair in the society? The Workshops Agenda Table of the second international Football Clinic congress is available for download in PDF format at the bottom of this table. Who is going to get the football clinic congress certification certified by the AFC? This electronic certificate is issued to all those who, on the first step, registered on the website of the Football Clinic Congress and paid for the related costs online and subsequently participated in the congress panels or workshops as an attendance. It should be noted that the scholars whose scientific papers are accepted by the congress are also among the recipients of this certificate. How do we get the certification of the Football Clinic Congress certified by the AFC? After the termination of the Football Clinic Congress, the section on the request for the issue of Certification on the website is activated. If you are one of those who we can provide them with a legitimate affiliation, you must log in to the site with the same username that you applied for the payment. Our colleagues will review your attendance at the congress and workshops, afterward we will issue an e-mail of the certification to you within a maximum period of 10 working days. Note that the full name of the certification is taken from the football clinic's website and after the issuance of the certificate, there is no possibility of renaming or re-issuing it. So, pay attention to the correctness and type of writing in your registration. Is it possible to pay a registration fee for participation in the congress or workshops, in person and on the day of the congress in cash? No, at this Congress, all registration fees, whether for participation in the congress or for participation in workshops, are made only through the website and online shopping, before the congress begins. Will the refund be paid if the conference is canceled or unavailable? No, due to the costs that the applicant pays after completing the registration, there is no possibility of repayment. To see the second international Football Clinic Brochure in full scale, please click on above picture.